Lynne is a Certified Personal Trainer Specialist and Lifestyle coach. Lynne’s passion for fitness, her commitment to her clients’ and relentless energy are the driving forces behind her success. Lynne is an avid outdoors person who enjoys spending time cycling, running, biking, and paddle-boarding. Exercise and good nutrition became a propriety for Lynne when she competed in the 2008 Ontario Physique Association show in Ottawa. Since then, Lynne became interested in educating, motivating and inspiring individuals to become healthier, lose weight, and gain self-confidence. Lynne is a graduate of Biochemistry at Laurentian University, and a member of the Canadian Fitness Professionals. She has studied human anatomy, exercise physiology, nutrition, as well as volunteered training for high school volleyball teams. Lynne has been working in the fitness industry since 2008. 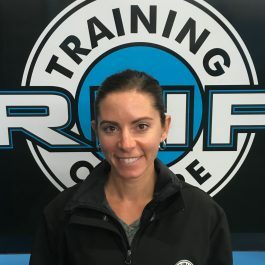 She has designed a private fitness studio, conducted several outdoor training programs, customized fitness plans for individuals and athletes and has taught Nutrition at Cambrian College. Lynne is able to provide individuals with complete fitness assessments and testing, weight loss and body sculpting programs, strength training, muscle building programs and various indoor and outdoor group fitness classes.